Bonnie J. Morris - Professor. Author. Speaker. Historian. Lecturer at Berkeley. And now, the Oprah Book Club choice for Women's History Month! Oprah.com listed it first in BEST BOOKS TO READ MARCH 2018! Order yours through Random House: 1-800-733-3000. View my talk at Politics & Prose (and others) by going to Cspan.org and entering my name. THE TIME TRAVEL NOVEL, now available from Bywater Books. From ALISON BECHDEL: "Holy Hildegarde of Bingen! Bonnie Morris brings history to vivid, hilarious life in this whip-smart time travel tour de force." Winner of the Devils' Kitchen Literary Festival prize in genre fiction; finalist for the Foreword award in LGBT fiction. Book number 12: prize winning chapbook SIXES AND SEVENS. I read this LIVE in its entirety on Pacifica radio station KPFK in Los Angeles at 10 pm on March 11th's Saturday night show hosted by Mark Torres; part of Lambda Literary Festival week. My writing space and loft at Hedgebrook: Meadow House. WOMEN'S HISTORY FOR BEGINNERS: C-Span Book TV's Book of the Month. Runner-up, New England Book Festival. 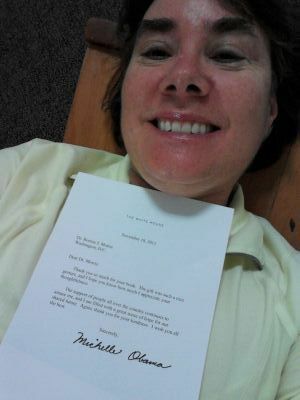 Fan letter from FIRST LADY MICHELLE OBAMA. She's reading Women's History For Beginners! The new volume of poetry, NOW AVAILABLE! Order yours now at www.finishinglinepress.com. Order the book based on my hot one-woman play! This volume was also Finalist for the Lambda Literary Award. Professor. Author. Speaker. Historian. Lecturer at Berkeley. And now, the Oprah Book Club choice for Women's History Month! Proud to have planned the first-ever Library of Congress exhibit on the women's music movement, which was on display from January to April. The accompanying lecture (March 8, 2017) is available online. Honored with the Ruth Rowan Believer Award from Women in the Arts at the 2017 national Women's Music Festival, in recognition of my thirty years' work documenting the women's music movement. Now touring with my new book, THE FEMINIST REVOLUTION, an overview of women's arts and culture in second-wave feminism, for Smithsonian Press. 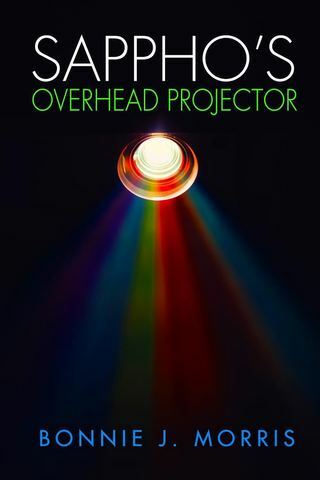 NEW BOOK, fall 2018: SAPPHO'S OVERHEAD PROJECTOR, the sequel to SAPPHO'S BAR AND GRILL. Already nominated for a "Goldie" (a Golden Crown Literary Society award) in fantasy/science fiction. Working hard in the Olivia archives as their official historian. Last winter: from January through April, my exhibit on the women's music movement of the 1970s/80s was on display in the Great North Hall of the Library of Congress. Three 42 x 22 agile cases showcased a timeline of artists, albums, concert photos and cassettes. I have moved to California to continue archiving the women's music movement with Bay Area resources and Olivia artists. While teaching at UC Berkeley and St. Mary's College, I'll continue working with the Smithsonian and Radcliffe's Schlesinger Library on the legacy of women's music festivals. So grateful for my ongoing relationship with Radcliffe and Harvard. January to April 2019 will find me as faculty aboard Semester at Sea's spring global voyage to 11 countries. 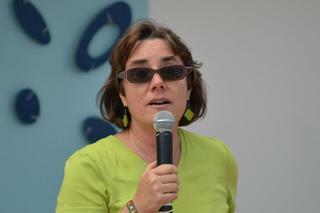 This is my third tour as SAS professor of global feminisms. Follow my voyage via https://www.semesteratsea.org. My thirteenth book, THE DISAPPEARING L: erasure of lesbian spaces and culture, is available from SUNY Press: www.sunypress.edu. I appreciate the support I had from a Hedgebrook residency, on Whidbey Island (in Puget Sound, near Seattle), where I wrote for ten stirring days in the cottage which has also hosted Gloria Steinem, Dorothy Allison, Alison Bechdel, Sarah Waters, Carolyn Forche, and Naomi Shihab Nye. 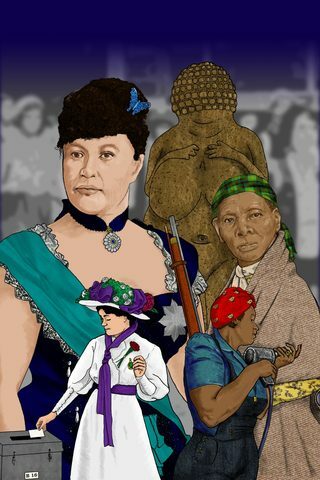 WOMEN'S HISTORY FOR BEGINNERS is unstoppable! After taking second prize in the New England Book Festival, I also received a fan letter from First Lady Michelle Obama, on White House stationery, thanking me for donating a copy of WHFB to the White House. C-Span Book TV made this their Book of the Month. 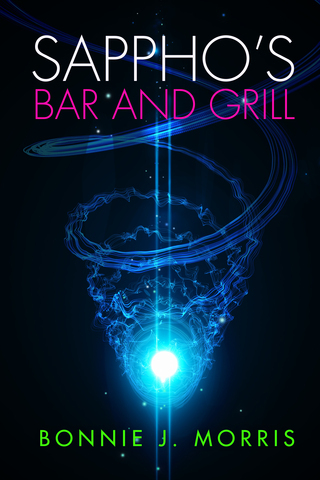 Now required reading at the University of Wisconsin is my tribute to ten years of note-taking in D.C.'s women's bars. THE BAR NOTEBOOKS was introduced at the 20th Anniversary Lavender Languages and Linguistics Conference at American University on 16 February; the book is available on demand from Bookshop Santa Cruz in California. Please also check out my earlier author interview on C-SPAN Book TV, available at http://www.c-spanvideo.org/videoLibrary. Go to www.booktv.org to see my C-Span interview. Get ready for stirring issues in women's history! 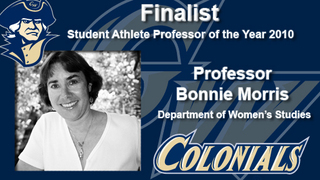 Finalist in 2010, finalist again for 2012 and 2016; and in 2011, actual PROFESSOR OF THE YEAR. Teaching women's history is my passion. PLAYS: "Passing," "Revenge of the Women's Studies Professor." ADVISORY BOARDS: The National Women's History Museum; Rainbow History Society of Washington, D.C.; National Women's Music Festival; Bay Area Lesbian Archives; Women's Studies Steering Committee, Georgetown University; Women's Studies Curriculum Committee, George Washington University; senior research fellow, Global Women's Institute, George Washington University. ARCHIVAL WORK: Field notes and taped interviews from 30 years of festival culture are willed to the women's special collection of Schlesinger Library at Radcliffe; collected student publications from the 1970s have been archived at Carolina Friends School for public use. 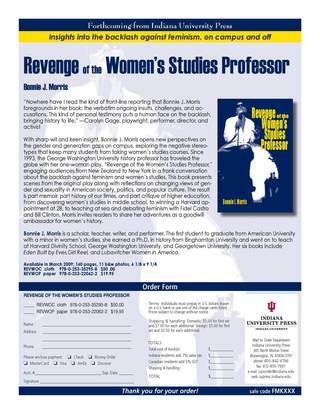 Bonnie J. Morris is a women's history professor and the author of fifteen books. Born on Mother's Day, 1961, she attended an international elementary school in West Los Angeles, participating in peace vigils with her parents from a very young age. After her family moved to North Carolina, she graduated from the Carolina Friends School, and then earned a B.A. in Jewish history from American University: the first student to complete a minor in Women's Studies at AU. She earned her Ph.D. in women's history at Binghamton University in upstate New York in 1989, soon thereafter joining the faculty of Harvard Divinity School and teaching for Semester at Sea. From 1994-2017 she enjoyed two half-time positions teaching for both George Washington University and Georgetown University in Washington, D.C. Courses included Approaches to Women's History, Gender and Athletics, Women and War, Lesbian History and Culture, and Introduction to Women's Studies. Dr. Morris began keeping a journal, handwritten in fountain pen ink, at age twelve, and has now filled 180 300-page volumes. Her public writing career includes essays published in over sixty anthologies of women's writing; a one-woman play performed in seen countries; and fourteen years with Mothertongue, D.C.'s spoken-word stage for women. Her essays have appeared in Comstock Review, Curator, the Chronicle of Higher Education, Del Sol, Gastronomica, Harvard Gay and Lesbian Review, Lilith, Memoir, Ms., Quiddity, Travelers' Tales, and the Washington Post. Seven books won national prizes. Three were finalists for the Lambda Literary Award: Eden Built By Eves (Alyson, 1999); Girl Reel (Coffee House Press, 2000); and Revenge of the Women's Studies Professor (Indiana University Press, 2009.) Girl Reel also won the ForeWord national prize for LGBT nonfiction. 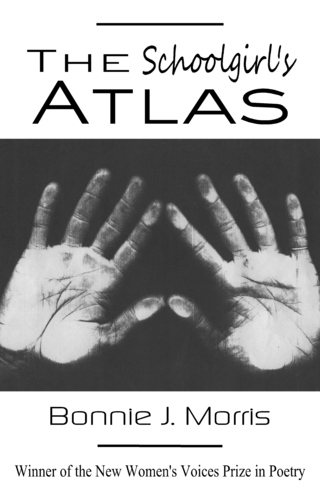 Women's History for Beginners took second prize in the New England B0ok Festival; The Schoolgirl's Atlas won the Finishing Line Press New Voices prize for a first volume of poetry by a woman writer. Sixes and Sevens won the Bloom prize for LGBT nonfiction. An Exam Leader for the AP U.S. History Exam, Dr. Morris has been a lecturer for Olivia Cruises and the global Semester at Sea program. She is now a consultant for Disney Animation, the Global Women's Institute, the American Psychological Association, Pacifica Radio Archives and the U.S. State Department's Academy for Educational Development, as well as contributing to Huffington Post. "When do I write? In the cracks, the nooks & crannies, the superlative fissures, the creased paper trails begging for my ink." One-woman play available for your campus or conference. A global success since 1993, this hour-long show has roused feminist audiences from Iceland to New Zealand. Lost lesbian spaces interview in the WASHINGTONIAN. A discussion on the disappearance of women's bars and cultural spaces in D.C.
Bonnie Morris guest narrates an hour of rare outtakes from Pacifica radio's women's music archives. Look for interview FTV 0487 on soundcloud, too!